In July this year we experienced the privilege of having Luis Lopez, a top cigar roller from the La Aurora factory, roll cigars in front of the Wesley’s shop in Rosebank. He was sensational. His skills and showmanship entertained us all for three hours. During this time he rolled 50 plus Robusto size cigars which were snapped up by eager customers of ours. What we didn’t realise at the time was that Luis was actually rolling a genuine La Aurora blend No.1495, with tobaccos specially prepared for his trip. Supplies of blend No.1495 have now arrived and they look beautiful, especially the Robusto, which is the cigar size Luis rolled for us. Those lucky enough to have smoked a freshly rolled cigar in July, should definitely try one of these from the factory and compare notes, if they made any, with the July experience. This could be interesting. If any of you have comments to share with us, I would be grateful to receive them. The term Robusto is a story in itself. It has become the generic term for any cigar approximately 50 ring size by 124mm length. Going back 40 years, Hoyo de Monterrey made a cigar with these dimensions - Epicure No.2 - and this cigar was definitely admired by the Connoisseurs. Whether by coincidence or not, when cigars from the Dominican Republic, Honduras and to a lesser extent Nicaragua started growing in the international market, each brand featured a 50 x 124 cigar (which was often named “Rothschild”) which rapidly became the most popular cigar in each range. I won’t say that there was confusion but there wasn’t a standard name for the 50 x 124 as there was for the 42 x 142 “Corona” for example. This all changed when the Cuban Cohiba 50 x 124 hit the market with the title “Robusto”. It was a case of …….. Thanks to Cuba Tobacco for clearing this up for us. **In the Wesley’s Dinner October 2011 – scored the highest points: superb technical qualities and smoothness, but was generally found to be short on fullness of taste. Technically three very good cigars each with the distinctive taste of their country of origin. The provenance of the tobacco is fundamental to its character. Try them, score them, and then decide when and with what you will smoke them in the future – because I’m sure you will. This is definitely true of the final of the three Edicion Limitada for 2012 – the Montecristo 520 (55 x 155). Here is a typical example of “bigger is better” – it commemorates the anniversary of 520 years of Cuban cigars in Europe. The cigar just has to be seen, touched, sniffed and smoked to fully appreciate the glory of tobacco from the Vuelta Abajo, aged for at least 2 years, and worked by the Cuban Masters of “the cigar”. I have always been a traditionalist in lighting up my cigar – wooden cigar matches, a cedarwood spill, or at worst a butane gas lighter. But times have changed: we smoke outdoors more often than not, so holding the flame steady to ensure a nice, even burn is almost impossible. Those first few puffs which should be so enticing can be ruined by uneven lighting. Yes, we all initially burnt the foot of our cigars almost to cinders, but the answer is a no-brainer – just double the distance between the jet flame and the cigar. Take advantage and don’t spoil those celebratory smokes this festive season! This full bent, flat-bottomed, tall-bowled, square pipe was custom-designed for “Oom” Paul Kruger and was the original “Oom Paul” pipe. Physically, the shape suited him. Kruger was a large squarely built man, with dark brown hair and brown eyes. He wore a moustache and full beard when he started to play a role in public life, but in later years a chinstrap beard and no moustache (Wikipedia). And the shape is very comfortable, resting on the chin with very little leverage on the teeth so that both hands can be free. The Oom-Paul (Afrikaans for Uncle Paul) is a pipe shape named after Paul Kruger, President of the ZAR (Zuid-AfrikaanscheRepubliek) during the late 1800's. It is defined as a bent pipe that has the end of the stem roughly in line with the top of the bowl. "Actually it’s the top of shank and bowl, and they didn’t say full bent. An alternative name for this shape (possibly from Dunhill) is the “Hungarian”, but this came some time after Paul Kruger died in 1904. Another research comment: “I love smoking an OomPaul style pipe – my nose gets to smell some of the smoke that rolls off the top of the pipe –fresh and fragrant”. The shape has long been popular worldwide, and over the years much poetic license has been taken with the classic shape by many manufacturers. Have a look at the wide range on the webpage of “Best Smoking Pipes”.We had a wonderful selection from Lorenzo in the 1970s under the heading “UnclePaul”. - The modern version has a trap for dry smoking, with 9mm Filter option and a teflon peg. A recently arrived shipment contained the T2 size in rustic and spot-carved, at better prices than before! Spot-carved R475.00 (54-LOPSPT2); Rustic R395.00 (54-LOPRT2). The production of pipes from the House of Lorenzo is divided in two: the mass produced, almost classic shapes made in Albania,and the limited production of original Lorenzo shapes made in Italy. The quality of the workmanship of the Albanian pipes has improved steadily and today their range of pipes covers standard and optional filter pipes in many shapes and sizes and in several qualities. We still buy the Italian Lorenzos whenever possible, and on our last visit we found a limited number of “New Era” Lorenzo pipes. These elegant, half-bent shapes in a satin, honey-blonde finish have no place to hide any flaws; any small fillings are visible but won’t impair the smoking quality. Optional 9mm filter. 25% off the Lorenzo New Era from Italy. Add one (or more) to your collection – a great way to start the New Year. I'm new to cigar smoking and would like to know what ur best selection of cigars that you could recommend to someone new as myself, something not too strong and smooth.what selection pack can you recommend? Thank you for your email - welcome to the world of cigars - the world's most affordable luxury. I would like you to read the introductory article on Cigar Smoking in the Wesley's Library (online). So be wise, don’t smoke until you are of legal age (18 years or over) and can make an informed personal decision. It includes descriptions of all types of cigars: their strength, burning rate, type of flavour; and how to select, cut, light, enjoy and store them. However, in the end the only way to find what suits you best is to buy some single cigars of different types and smoke them slowly and quietly over a period of time. Make notes for each: Did you like the flavour; What time of day did you smoke them; Had you had food – savoury or bland; Did they last too long; Was the draw comfortable. By law you are not allowed to receive tobacco products through the post, and we may not ship to private individuals, so visit your nearest Wesley’s. To assist we have put together a 5-pack and several 3-pack Selections to enable you to compare different cigars, with full descriptive leaflets. The International Selection (in a re-usable wood travel case) contains cigars from Cuba (budget and premium), Dominican Republic (Davidoff, technically one of the best cigars in the world), Honduras/Nicaragua, Holland – plenty to experience. For a short smoke – the Short Selection: three really good quality cigars, yet completely different. The Robusto Selection – gives you the opportunity to try one of the most popular shapes in any brand of hand rolled cigars. Then sit back, relax – maybe in front of your computer where you can browse through the list of articles on different subjects of interest to cigar smokers. Start with the Subject Index. • Smoking outdoors; • Summer Care; • Winter Care (winter will be here soon); and many more. Once you find an article you wish to read, find it under its number on the Number Index (or use the link at the top of the subject page). These articles are written and published on the website every 4 weeks, with articles for pipe smokers in between, and always a special offer.We have added your email address to our database, and you will receive an email once a month to let you know about the article and current offer. Remember to use the correct ashtray – one that will allow you to rest the cigar level, with a big enough bowl to hold the ash. Nothing ruins the cigar experience more than smoking it too fast because it is too big: You are finished before the cigar is! And it is disappointing to be just getting into the enjoyment of the cigar – and it is finished. So, try to select the right size for the time available - experiment. I look forward to meeting our correspondent if he is within reach of the Rosebank store, or he will be equally welcome at any Wesley’s. What do you know about the requirements of a good Cigar Ashtray? Does yours fit the bill? less 25% off all Cigar Ashtrays while stocks last. Make the most of your pastime – you will enjoy it more if you treat your cigars properly. Remember, the 10cm long Cigar Matches can be struck to light one cigar –the remainder of the match can serve as a taper. The shorter Danish Pipe/Cigar matches are 5.7cm long – 60 in the box for R11.50! 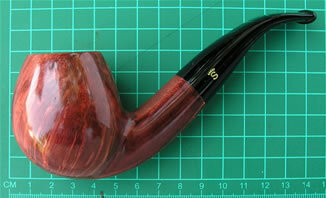 “Danish” pipes in general really came onto the world pipe market in the 1950s and early 1960s. The big brand names as I remember were Kriswill, Georg Jensen, W O Larsen and Stanwell (who became the major producer in Denmark). were in great demand in Europe in 1942. Stanwell commissioned 2 top Danish pipe artists to assist them with their range of shapes – which they then registered in the name of Stanwell. Being astute business people, they included in their range at least 2 almost classic English shapes – the billiard and the bent billiard. Stanwell, as a company, has always been inventive and innovative. They pioneered the use of a metal template from which four bowls could be turned simultaneously. The Danish carver Sixten Ivarsson (now considered the father of modern pipemaking) was commissioned to create new shapes capturing the spirit of the “Freeform” movement, but suitable to be made in series. Each shape was perfect and true to the vision of its creator. Suddenly “Freeform” pipes were affordable to a larger pool of Pipesmokers. Stanwell was again amongst the front runners when the new acrylic mouthpieces were introduced. These do not discolour or become bitter tasting through excessive exposure to moisture, from either the mouth or a humid atmosphere. Stanwell developed their own version - fitted with Delrintenons which are less likely to break, especially when the pipe is dropped. The tenons accommodate optional 9mm filters. NB If you don’t use the filter – use the adapter!! As we wrote in 2011, for economic reasons the production of Stanwell pipes is now in Italy – but the quality, designs and finishes are unchanged. The logistics are something different! We received no pipes until the end of 2012. The production is more limited and the ordering system has changed: We ask for the current stock on hand and order our pipes; and then don’t necessarily receive our full order. We now plan to check the stock on a regular basis and prepare smaller orders each time, which means the available shapes (9mm range only) will also change regularly, and the quantities will no doubt be limited. They are great pipes! Well worth the wait and the rigmarole. The standard range in three different finishes – Vario, polished De Luxe and Satin SilkeBrun, in assorted shapes. And three Speciality pipes – Taper-stem Rhodesian in glowing black sandblast with polished rim, and the chunky “Viking” shape in autumn-brown polished finish and in Stanwell’s lovely black Sandblasted finish. including the Speciality shapes, and the limited edition Beijing Bamboo. The word “boutique” originally meant a small shop selling fashionable clothes or accessories. But the use of the word has extended into a description of a small, speciality hotel, where care of its guests is the prime concern; or indeed into a description of any high quality item made in limited quantities. In cigars this can apply to normally-mass-market items that are produced in small numbers thus offering the manufacturer the opportunity to create something really special. We found such cigars for you - the “De Hertogh” cigars (formerly Young Selection), rolled in a traditional factory with traditional care from 100% pure natural tobaccos. Last year on the way to the InterTabac fair in Dortmund we had the opportunity to visit the factory in Belgium, just a few kilometres from the border of Holland, where the factory was originally located. We had been booked into a Boutique hotel, just inside the Dutch Border. More than just a pretty hotel in the woods, Hotel de Kempen was built on the skeleton of an old tram station between two roads. The entire roof is covered with solar panels – it generates sufficient electricity for all its own needs, and can sell excess energy back into the Dutch power system. The next morning we were taken to the factory. What a pleasant few hours we spent with Ton Buenen, having him explain and show us the whole process: from piles of raw tobacco to the finished boxed products. The annual production of the factory is around one million sticks, which is very small for this industry; but this is their strength, as it allows them to aim high in the quality of production and to use exotic tobaccos to produce more taste and smoothness in the cigars. Ton runs a tight ship. All staff multi-task in the office and along the production line. The production line is in part semi-automatic but that there are still procedures which demand individual hand attention. One of Ton’s problems is that some of the machines with which he works are no longer made. In anticipation of breakdowns, he has accumulated several stand-by machines from factories that have closed down; or from factories which have moved towards more mass-production, with automated production lines. The overall perception with which we came away was that Ton and his team are very proud of their products and have no intention of trying to compete in the mass-market trade. One of the key factors in the cigars produced in Ton’s factory is the association with Gerald de Graaff, considered to be one of the top blenders of European cigars. An unexpected bonus on our visit was to watch Gerald assemble the filler for one of his special blends – adding to the basic blend a “handful of this and that”, genuinely by hand! Then shovelling all the ingredient tobaccos together with a large flat spade. Amazing talent, with amazing results – as I can testify from his hand-rolled short filler cigars which I have been fortunate to smoke when we visited his home in 's-Hertogenbosch, Holland. Another benefit for you: in October 2012, I was finally registered as an importer of “explosives”. At last we can offer you the longer, thicker matches to light up your cigars, pipes and braais. less 15% off longer, thicker matches while stocks last. If you haven’t yet tried a cigar from the Young Selection you are missing an amazing Dutch Treat.